The beginning of this story takes place about one year ago. I worked as a telemarketer at a company, and looked for something in an archive room. By accident I found a Thinkpad 600E, seemingly abandoned. After a bit of nagging to the boss, he said I could keep it. It came with a 10 GB hard drive, which was not super big, but it was somehow sufficient for my needs back then. But one night disaster struck. I had left it on over the night, and when I woke up the next morning the screen was black. When I tried restarting it the HD just clicked a few times and then gave up. When booting a live CD, the result was that no drive could be detected. The HD was simply broken, probably an arm fell off or something. I got a temporary drive from a friend, 6 GB, and a pinch slower than the 10 GB one. But the I decided to seriously refurbish the laptop. I invested in a PIII CPU, which I overclocked, by soldering a resistor to the clock circuit, and bypassed speedstep on the CPU by soldering a resistor there as well. It all ended up at 702 MHz. About one week ago something happened that marked the end of the golden era for my Thinkpad 600E. By now, the battery life had been heavily reduced, and the battery would typicaly last for only 10 minutes or so before giving up, and my TP power adapter was suffering from loose contacts at both ends of the wire, in other words you had to wiggle the cable around at two places in order to get it right. All this wiggling of course led to more damage on the cable, until the situation was unbearable. This was supposed to be no problem, since I had an adjustable voltage supply that could easily replace the original TP adapter. That day I was going to present a piece of homework, some assembler code for the NIOS-2 CPU. I thought reliabilitym would be a good thing for this presentation, so I packed down my secondary power supply. Before plugging it in, I double checked the voltage and polarity, but somehow I still got the polarity wrong. I don’t know how I could just miss it, but I did. Suddenly I felt the familiar fume of burnt electronics. It seemed as if the switching regulator in the computer was destroyed. (It still ran fine on batteries) After doing an initial check for exploded caps, obviously burnt out IC’s or blown fuses, I came to the conclusion that this is beyond my skill of fixing. So, I went back to the store where I bought the 80 GB HD. I had seen a pile of laptop junk there, and even one or two 600E’s. One was cheaper, (Corresponding US$50) but was partially broken according to the guy in the shop. I thought the error messages looked fixable, so I paid for it and walked away. Unfortunately, i was wrong. The computer could appearantly not sense the CMOS battery. I got the errors 161 and 163, CMOS data lost and time/date not set, respectively. After setting the date, I got a OFF->ON message, meaning that I was supposed to power cycle the laptop. If it had been working properly, it had continued to boot by then. Instead I ended up with the same error, when turning the power on again. Normally this indicates a drained battery, however not in this case. 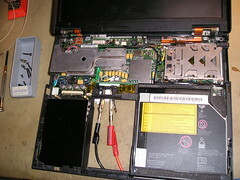 The battery was fine, my voltmeter and other Thinkpad agreed on that. So I went back to the shop and demanded to get a refund or a replacement. At first he just violently refused. He insulted me, accused me of being a liar and having tampered with the computer. Well, I actually “tampered” with it when I instaled the new CPU. But that was definitely not the cause of the problem. I even saw the error in the shop when testing it before buying it, just that I thought I could fix it. After a lot of discussion, he accepted to replace the broken computer with the other 600E he had in stock. I carefully tested it before leaving, and it booted up ok. It had a minor display error; the display had a slight red tint, which vanished in seconds as the monitor warmed up. Finally I thought everything was alright. I was even delighted to see that he had forgotten a dual function network/modem card in PC ard slot. I inserted the CPU, soldered the overclock resistor in place, inserted the HD and booted it up. At first the HD wasn’t recognized, but I just needed to upgrade the Easy setup (IBM’s horrible version of a BIOS) Btw, this was done by burning floppy image to a bootable CD-ROM. If there’s interest in it, I can make that CD image available. Then it worked like a charm. The network card was immediately detected, the screen sememd a bit brighter than on the one with a broken power regulator and the overall speed seemed higher than before. I was at peace. Finally I got my laptop back. The joy didn’t last for long, however. Suddenly it just crashed, for no appearant reason. 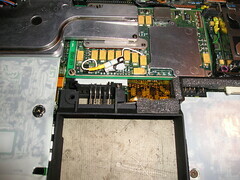 After a bit of error seeking I tracked down the error to the PC card slots. Inserting anything into the slots would at best make the OS not detect the hardware correctly, and at worst bluescreen or segfault. But never just detect it and work. I’ve tried driver fiddling, booting live CD’s to see if something happens differently, resetting CMOS by unplugging the battery, doing the Easy setup upgrade routine once more, just to make sure. 1) that the overclock resistor might be positioned in such a way that it interferes with the PC card controller. However, this seems farfetched, since the resistor was placed the ame way in the original TP as well, without ever causing these kinds of problems. I’ll move it a bit and see if there’s a change, but that’s probably not it. 2) that the damage was caused by a glitch in the power net. This doesn’t match timewise, however. About an hour after the error happened, there was a short voltage drop of a few milliseconds. If there had been one right before the error happened, I would’ve noticed. Besides, I don’t see how a power dip could cause problems, like a power surge can. Also, I don’t see how the error could’ve attacked only the cardbus controller. The two thing that were connected at the time was power and network. If it had come through the power supply, the CPU would definitely have been damaged first. If it had come through the netword, my router and the network card would’ve been damage in the first place. So I conclude that neither of these things are likely causes. I’m starting to edge out about this. It’s almost as if I’m destined to not have a working laptop. 1) LOL, I wonder what hidden errors this one has. 2) Damnit, I can’t concentrate on music making if I have internet access on the same computer. The only problem is that I got limited backup possibilities. Copying a few wave files to a memory stick works ok. (Even though it’s a USB1 connection) But, I also have about 50 GB of other data that I want to back up. However, at least I backed up my whole soUnd folder (Yes, I spell the folder name with a capital U) before I destroyed the first TP with the wrong polarity. if there are any news, I’ll post about it here. In the position I am now, I’m almost considering setting up a paypal donate button and try to beg for some money from my readers. But neh, you probably wouldn’t donate anyway. This page was previously hosted on http://gameboygenius.8bitcollective.com/wordpress/category/thinkpad-600e/ (*).